 Experiments were conducted in 1999 and 2000 at Kearney Agricultural Center. Branches were obtained from a prune (cv. French) orchard. Inoculations were conducted at each of five blossom stages: popcorn, full bloom, late full bloom, petal fall, and fruit set. Branches showing uniform blossoms were cut and inoculated with conidia suspension of M. fructicola. One inoculum concentration (IC) (10,000 conidia/ml) was used in 1999 and three inoculum concentrations (1,000, 5,000, and 10,000 conidia/ml) in 2000. Inoculated branches were covered with plastic bags to keep high humidity and separately placed in incubators at 41, 50, 59, 68, 77, 86, and 95 ºF [5, 10, 15, 20, 25, 30, and 35ºC] in the 1999 experiment and at 50, 59, 68, 77, and 86ºF [10, 15, 20, 25, and 30ºC] in the 2000 experiment. Wetness durations (WD) of 24 hours in the 1999 experiment and 4, 8, 12, 16, 20 and 24 hours in the 2000 experiment were created by uncovering the plastic bags at different time after inoculation. All inoculated branches were removed from the incubators and placed at room temperature for 2 days and then in a storage room at 4ºC for 3 days to promote sporulation. The numbers of total inoculated blossoms and those blighted showing sporulation of M. fructicola on the flower calyx and stem were determined for each branch, and the proportion of blighted blossoms (PBB) was calculated for each inoculated branch. The most susceptible bloom stage was at the full bloom (Fig. 1A). After that stage, the susceptibility to infection decreased, and no blighted blossoms were observed at the fruit set stage. The relationship between PBB and temperature fitted a one-peak curve (Fig. 1B). The optimum temperature for infection and blossom blight development (the peak of the curve) was at 73.6 ºF [23.1ºC]. The PBBs below and above this temperature decreased, and were 0 at 41 and 95 ºF [5 and 35ºC]. The concentrations of 5,000 and 10,000 conidia/ml caused significantly higher PBBs than the concentration of 1,000 conidia/ml (Fig. 2A). The PBB also linearly increased along with increased wetness duration (Fig. 2B). 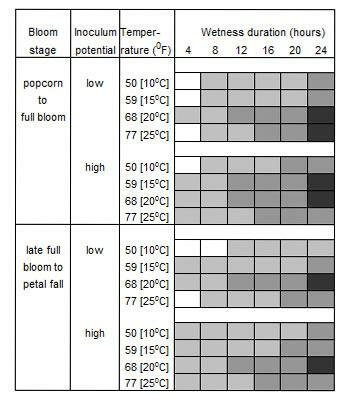 We considered relative risk of blossom blight under different orchard conditions, including inoculum potential, temperature, and wetness for different bloom stages. The inoculum potentials were simply classified into two levels: low (1,000 conidia/ml) and high (5,000-10,000 conidia/ml). Linear regression between PBB and wetness duration for each blossom stage and temperature treatment was obtained. The parameters of these regressions were used in a computer program SRK1 to produce the distribution of PBB for each combination of bloom stage x inoculum potential x temperature. From the distribution, we obtained the PBB value with 90% probability (PBB90), meaning the 90% certainty that predicted blossom blight could not exceed this value. We found that the combined condition of 68ºF [20ºC] with 24-hour WD with high inoculum potential at early bloom stage was associated with the highest PBB90. Therefore, the situation of these combined conditions was used as the most "favorable condition" for blossom blight. The PBB90s under other conditions were used to calculate the relative risk of blossom blight by dividing these PBB90s by the PBB90 under the most favorable condition. The relative risks (RR) were classified into 4 levels as: no risk when RR = 0.1, low risk when 0.1 < RR = 0.4, moderate risk when 0.4 < RR = 0.7, and high risk when RR > 0.7. A schematic diagram for the risk of blossom blight was produced to guide blossom blight control (Fig. 3). In this diagram, we classified the bloom period into two stages and the inoculum potentials into two levels. Temperatures from 50 to 77ºF and wetness durations from 4 to 24 hours were considered. Growers can find the possible relative risk of blossom blight based on their orchard-specific conditions. For example, there will be no risk of blossom blight at early bloom stage (from popcorn to full bloom) when temperatures were below 50ºF [10ºC] and wetness duration was shorter than 4 hours. When wetness duration is 24 hours, there will be a high relative risk of blossom blight at 68 and 77ºF [20 and 25ºC] when field inoculum potential is low, or at 59 and 68ºF [15 and 20ºC] when field inoculum potential is high. Fewer cases with a high relative risk may occur at late bloom stage (from late full bloom to petal fall) than at early bloom stage. Only the 24-hour wetness duration at 68ºF [20ºC] with either low or high inoculum potential may be associated with very severe blossom blight. Most condition combinations would result in low to moderate risk of blossom blight (Fig. 3). This schematic diagram can be used as a reference in decision making for fungicide application to control blossom blight.